A large assemblage of pottery from Aller Cross, Kingskerswell, became available for study after this article was submitted for study. 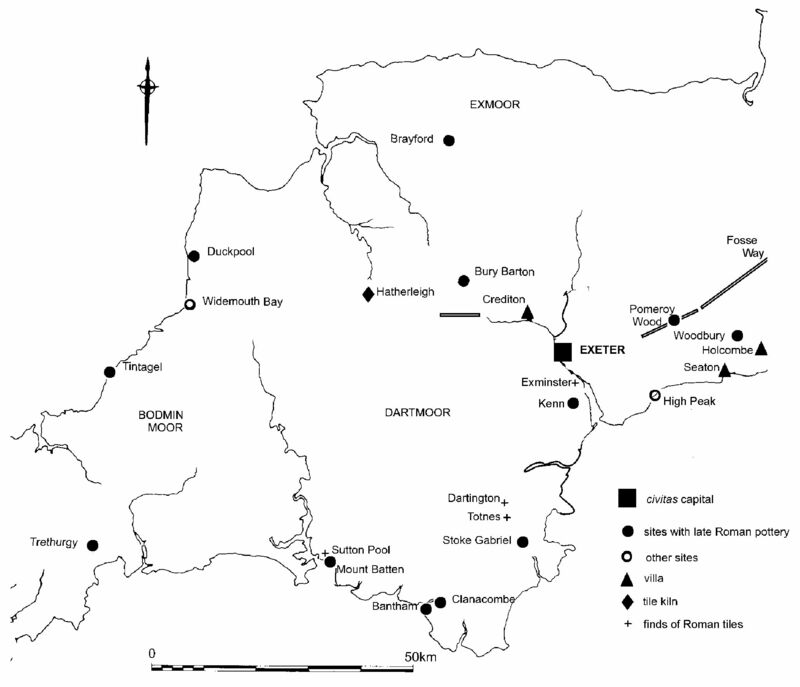 The site, which lies 9.5km north-east of Dartington (Figure 1), consists of a series of enclosures and seems to have been occupied continuously from the Iron Age until well into the 4th century AD (Hughes forthcoming). Ceramic building materials, including hypocaust tiles and a chimney or ventilator, indicate that there were masonry buildings nearby. A full account of the Roman pottery has been prepared for publication (Bidwell and Croom forthcoming); the following comments are included by kind permission of AC Archaeology. The pottery from Aller Cross is by far the largest Roman assemblage (73.19kg) to have been recovered from Devon to the west of Exeter. Most of the pottery is of 3rd- and 4th-century date. There are no types in either the coarse or finewares that can be dated exclusively to the later 4th century and no other finds, for example coins, that say anything about the date at which occupation on the site came to an end. Changes in the pattern of pottery supply, however, were apparent in the course of the later Roman period. Until the later 3rd century the commonest pottery was in an apparently local ware (Aller Cross fabric), though there were also significant amounts of BB1 and South Devon ware. By the end of the 3rd century production of the Aller Cross fabric had come to an end, and the main coarseware in use was South Devon ware; there was also a marked increase in the amounts of BB1 from south-east Dorset that reached the site. In the final phase there was an almost total reliance on South Devon ware, and BB1 was no longer reaching the site. At Exeter, only 24km to the north, the latest deposits always contain more BB1 than South Devon ware, and, as has been explained above, nothing has emerged to suggest that there was a final period of pottery use when BB1 no longer arrived at the town. At Aller Cross two explanations can be proposed for the absence of BB1 in the latest deposits. First, South Devon ware continued to reach the site after production of BB1, or at least export of the ware beyond its homelands, came to an end. This seems doubtful because export of BB1 to Exeter continued until pottery use ended, presumably not before the end of the first quarter of the 5th century and possibly somewhat later, while the assemblage from Bantham indicates that production of South Devon ware had come to an end by the second half of the 5th century and quite possibly some decades earlier. Rather more likely is a contraction in the market for BB1. Exeter might have remained a major market for BB1 while settlements in South Devon and perhaps Cornwall no longer received this pottery.